Your job failed to save at this time. Please try again later. Sorry, this job expired on Sep 23, 2018. Below are other jobs that may be of interest to you. What makes White Dog Café special and a great place to work?! Cuz’ we give a damn! We are part of Fearless Restaurant Group; a multi-concept group of 8 independent restaurants based in Philadelphia, PA and Long Beach Island, NJ. As a company, we are defined by our talent, teamwork, resources, opportunity and a workplace built on loyalty and respect. We're a creative, ambitious business with an aggressive growth strategy and require like-minded leaders to join us as we move forward. White Dog Café opened its first location in 1983 under the helm of pioneer and social activist Judy Wicks. For 35 years it has been supporting our local farmers, cheese mongers, fisherman, brewers, artisans and bakers. In 2009, Marty Grims bought White Dog Cafe to continue the legacy, adding culinary inspiration and service commitment. Since 2009, we have opened an additional 2 concepts in Wayne, PA and Haverford, PA. We are committed to enriching our local communities and economies! A White Dog Café Host will be an expert at welcoming our guests into our home with warmth, enthusiasm, and grace in this fast-paced, multi-faceted, neighborhood cafe. This candidate will have a desire to continue to learn and grow within our organization. • Be happy and constantly smiling! • Hourly rate $10-12/hour with great room for ADVANCEMENT! Health/dental insurance (full time), short-term disability, Employee Dining Program @ 8 Fearless Restaurants, career growth! 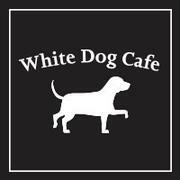 White Dog Cafe has been engaging its local community with award-winning contemporary American cuisine, since 1983 in Philadelphia and since 2010 in Wayne. Known for creative menus, using the highest quality farm-fresh ingredients and humanely raised meats and poultry, our menus change weekly to capture the best local, seasonal and sustainable grown foods available. Our inspiring menus are complimented with an all American wine list, local craft beers and seasonal specialty cocktails and refreshing mocktails served with warm hospitality. If you are not a member yet, please sign up here.